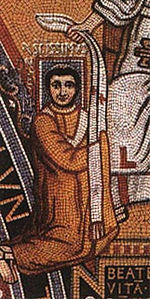 Pope Leo III (died June 12, 816) was Pope from 795 to 816. Pope Leo III is best known for crowning Charlemagne as the first Holy Roman Emperor and for promoting the vision of the Christian world as a single, orderly, peaceful society under the ultimate authority of the Bishop of Rome as Christ's deputy on earth. This understanding of the papacy claimed temporal as well as spiritual power, symbolically represented by the imperial dress that the popes wore, the purple mantel and scarlet tunic. Leo pioneered what became the king-making role of Popes, although the actual relationship between papacy and the temporal powers was never as simple as the doctrine of the monarchical supremacy of the papacy implied. Nonetheless, as a result of his legacy, Europe remained a more unified, peaceful society with a greater sense of co-responsibility and of a common, Christian identity that transcended national borders. This had implications, for example, in the legal sphere, since ecclesiastical law was the same across Europe, even if civil law differed. The Church's near monopoly on education, too, meant that it trained the scholars and the lawyers, who tended to share the single-society view of the Christian world. Leo was the son of Atyuppius and Elizabeth. Unlike many of the Cardinals and those who entered the papal household, he was not a member of the nobility. Little is known about his early life. He rose through the ranks of the papal clerical hierarchy to become a Cardinal Priest, and Treasurer. His election as Pope, however, on the day that his predecessor, Adrian I died, was unanimous. However, he appears to have aroused the hostility of Rome's nobility, who saw the papal post as reserved for noble candidates. Possible, this hostility was aroused when, straight after his consecration, Leo sent the keys of Rome to Charlemagne, indicating that he recognized the Frankish king, with whom Adrian I had enjoyed a close relationship, as Rome's protector. The Roman aristocrats would have resented placing Rome under the protection of a non-Roman. In April 799, Leo was attacked by a gang whose members included a nephew of his predecessor, who attempted to gouge out his eyes and cut off his tongue. He was accused of adultery and perjury. He was then formally deposed and sent to a monastery, but escaped and made his way to Charlemagne, who escorted him back to Rome under royal protection. On Christmas Day, Leo placed the imperial crown on Charlemagne's head, resurrecting the office of Emperor of the Roman Empire, which became known as the Holy Roman Empire. Charlemagne went to Rome in November 800, and on December 1, held a council there with representatives of both sides. Leo, on December 23, took an oath of purgation concerning the charges brought against him, and his opponents were exiled. Two days later Leo crowned Charlemagne after the latter prayed at St. Peter's tomb. we by this present do give our imperial Lateran palace, then the diadem, that is, the crown of our head, and at the same time the tiara and also the shoulder-band,-that is, the strap that usually surrounds our imperial neck; and also the purple mantle and scarlet tunic, and all the imperial raiment; and also the same rank as those presiding over the imperial cavalry, conferring also even the imperial scepters, and at the same time all the standards, and banners, and the different ornaments, and all the pomp of our imperial eminence, and the glory of our power. Although it purports to have been written by Constantine, and refers to Pope Sylvester, it may have been Adrian I who referenced the text for the first time. In the West, the Church had imposed Christian characteristics on the law, it had achieved a dominant role in the agrarian economy, and it has established a monopoly of education and culture. Now it had the chance to integrate the basic system of government with Christian teaching and practice by making the ruler a functionary of Christian theology. The empire may have crumbled but if the Pope's blessing was necessary for any king to be recognized as legitimate, even though power was vested in many and not in a single temporal ruler, there was one ultimate authority, the Pope. This was also supported by much Roman Law, which was also generally recognized. There is little doubt that Charlemagne saw himself as superior to the Pope, since without his protection, the Pope would not survive. On the other hand, since there was no automatic right of succession in Frankish law, the church's blessing was understood as a necessary, sacramental seal of succession. If the Pope claimed to be the "residual legatee of the" Roman "empire in the west," as expressed in the Donation of Constantine, it seems that as far as the Emperor was concerned, he was "head of the church as well as head of the State." Charlemagne, however, is said to have truly loved him. Historian Paul A. Johnson suggests that at this time, it was believed that the end of one reign and the start of the next required sacramental intervention to "break the magic of the old line" and transfer this "to the new." As head of the church, the Pope was the senior sacramentalist, so was in prime position to confirm the king's authority. If nominally this made the Pope superior, in reality Charlemagne knew that since the Pope needed his protection, he was "therefore inferior," whatever the Church itself taught. Leo helped restore King Eardwulf of Northumbria, and settled various matters of dispute between the Archbishops of York and Canterbury. He also reversed the decision of his predecessor in regards to the granting of the pallium (the symbol of the rank of archbishop) to the bishop of Lichfield, Higbert. He believed that the English episcopate had been misrepresented before Hadrian and that, therefore, his act was invalid. In 803, Lichfield was a regular diocese again. Leo forbade the addition of "filioque" (the spirit as proceeding from the Father and from the Son, always opposed by the Eastern Church) to Nicene Creed which was added by Franks in Aachen in 809. He also ordered that the Nicene creed be engraved on silver tablets so that his conclusion might not be overturned in the future. He wrote "HAEC LEO POSUI AMORE ET CAUTELA ORTHODOXAE FIDEI" (I, Leo, put here for love and protection of orthodox faith) VITA LEONIS, LIBER PONTIFICALIS. Following Charlemagne's death (814), the nobles of Rome again attempted to rebel against Leo. He had some of the conspirators imprisoned and executed but did not himself survive the Emperor for very long, dying in 816. He was succeeded by Stephen IV. Buried in St. Peter's, his relics lie close to those of Leo I, Leo II, and Leo IV. During the reign of Leo X, he was immortalized by Raphael bearing the images of the Medici pope. Both, therefore, are in the power of the Church, that is to say, the spiritual and the material sword, but the former is to be administered _for_ the Church but the latter by the Church; the former in the hands of the priest; the latter by the hands of kings and soldiers, but at the will and sufferance of the priest. However, one sword ought to be subordinated to the other and temporal authority, subjected to spiritual power. This also created the investiture controversy between popes and lay rulers about who had the authority to appoint bishops. On the one hand, the papacy never acquired its own military capability to any real extent. On the other hand, it was a wealthy institution and some bishops combined spiritual with temporal jurisdiction, which made these sees very attractive to men who had little interest in the priestly life. Sometimes, bishops appointed by kings (or who paid for their appointments) were not even ordained. Leo was declared a Saint in 1673. His feast day is June 12. ↑ Hanover Historical Texts Project, The Donation of Constantine. Retrieved October 10, 2007. ↑ Boniface VIII, [Unam Sanctam, 1302. Retrieved October 10, 2007. Translation of Einhard's Life of Charlemagne (c. 817-830, translated in 1880). This page was last modified on 25 June 2018, at 21:49.